Not all individuals will qualify for Chapter 7, so Chapter 13 might the only available relief. Chapter 13 can be an effective way to handle tax debt. Chapter 13 provides relief from mortgage or car loan arrears. Under special facts Chapter 13 is a mechanism to “lien strip” a wholly unsecured junior mortgage loan. Chapter 13 requires regular monthly debt payments to a Chapter 13 trustee. As a result, not everyone will qualify for Chapter 13. You must prove to the court that you have enough “disposable income” to cover all required payment obligations. If you have irregular income or income that is too low, the court may not approve your repayment plan. Additionally, if your debt is too high, you may also be ineligible. In Chapter 13, secured debts cannot exceed $1,149,525 and your unsecured debts cannot exceed $383,175. The key component to a Chapter 13 bankruptcy is the repayment plan. You file paperwork with the court that proposes a plan to pay your creditors at least some of what you owe them. You must have “disposable income” after allowed expenses to be able to propose a plan. After you file your plan, a court must approve the repayment plan. Then, instead of making your payments to creditors, you make monthly payments to a Chapter 13 bankruptcy trustee who then pays your creditors. How much you pay and who receives payment first depends on numerous factors. Your bankruptcy attorney will help you better understand this process. Each case is specific to the individual’s unique situation. Certain types of debts must be kept current and any arrears paid in full during the repayment period. These include child support, alimony, wages owed to employees, bankruptcy attorney fees paid through the plan and certain taxes. Secured debts are monies owed that are secured by collateral. The most common examples are a car or house. If you wish to keep the property, the repayment plan must provide for regular, timely payments of all secured debts. Additionally, you must repay arrears (late payments) in your plan in full during the repayment period. Fixing or holding interest is a common occurrence. If a secured loan is paid off in full prior to the end of your repayment plan, you may have a “step up” in your available income to be paid into the plan. In most Chapter 13 repayment plans, general unsecured debts are repaid only in part, and the rest are discharged at the end of the repayment plan. The most common types of debt in this category are credit cards, personal loans, medical debt and utilities. Under the bankruptcy laws, bankruptcy cannot discharge certain types of debts. In addition to Priority Debts, discussed above, other nondischargeable debts include student loans (in most cases), government fines, payment of restitution, DUI-related death or personal injuries, unlisted creditors and a few other special categories. Your income determines the length of your repayment plan. If your average household monthly income (the average of the 6 months of income prior to the filing date) is greater than the median household income for your state, based on your household size, then your repayment plan proposal must be for 60 months. However, if you income is lower than the median, you may propose a 36-month plan. In some cases, a below-median debtor may wish or need to extend the plan beyond the 36 months to allow for affordable monthly payments. You will remain under the protection of the bankruptcy court (from garnishment, collections), etc. as long as you stay current in your repayment plan and meet other obligations dictated by the plan. However, if life circumstances do not allow you to finish the plan (e.g. job loss, illness), you may have an opportunity to modify the plan or convert to a Chapter 7 bankruptcy. It is best to consult your attorney before you miss any payments. It is much easier to consider options before your plan payment is late. A court can dismiss your plan if you don’t make payments. In some instances, Chapter 13 bankruptcy allows for a second mortgage or HELOC to be stripped from the property. In order to “strip” a junior lien from a property, or convert to an unsecured debt, your Chapter 13 attorney must file special motions with the Bankruptcy Court. Additionally, Chapter 13 bankruptcy “crams down” car loans. Simply put, your car’s value is reduced to the amount you owe on the car loan. These situations are very fact specific and not all cases will qualify for a lien strip or “cramdown.” Your bankruptcy attorney can help you better understand if these options might be available to you. Once you have made all the payments under your repayment plan, all the remaining debts will be wiped out. Before your discharge, you must show the court that you are current on any child support and/or alimony payments and completion of the required debtor education course. To learn more about Chapter 13 bankruptcy, schedule your free consultation with Minneapolis Chapter 13 bankruptcy attorney Gregory J. Wald. Call (952) 921-5802. How To Handle Enormous Debt Load Right After Receiving Your College Degree. Enormous Debt : More than ever, young adults are being saddled with an enormous amount of debt right after they earn their college degree. They spend the rest of their twenties giving a sizable portion back to the University who just won a bowl game and is hardly hurting for cash. Meanwhile, you’re a twenty something lawyer who passed the Bar exam, works for a prestigious firm, yet you eat Ramen and take the bus and duck your landlord at the end of the month. That’s no way to enter the workforce–straddled with debt. Here’s the alternative. Continue on eking it out. Giving most of your pay to your wealthy college who’s degree you might not even be using! Take the bus. Go broke trying to impress clients by paying for your meals only to find your wages have been garnished and your card doesn’t work. You can expect that for much longer than seven years if you don’t file for bankruptcy. You don’t want to have to play that game where you act like: “it’s the banks fault” in front of potential clients. You know good and well there was a fifty-fifty chance your card would work, which is why you only ordered salad and water. You cringed when the potential clients ordered swordfish and champagne. And then came the coup de grâce? Potential client #1 liked the swordfish so much he wants a second to go. For his dog! Your mental cash register just exploded. You know what’s coming. Epic embarrassment. You see it on the waiter as his or her demeanor has now changed. They have your card in their hand and a single, short, stubby receipt. We all know what that is. The rejection letter of debit machines. Just like when you got into college. Thin envelope meant: “Sorry! Try again!”. Thick envelope meant :”Pack your bags”. Don’t get another thin envelope or short receipt. Get your affairs in order. What you handle today will greatly behoove you tomorrow. We will get creditors off your back and allow you to entertain those potential clients without fear of embarrassment. If you have an income tax debt, and are filing for bankruptcy, that may be eligible for discharge under Chapter 7 or Chapter 13 of the Bankruptcy Code. The difference between a Chapter 7 bankruptcy and a Chapter 13 bankruptcy is that Chapter 7 allows for a full discharge of permitted debts while Chapter 13 issues a payment plan to repay some debts, with the rest of the permitted debts being discharged. Keep in mind, not all tax debts are able to be discharged in bankruptcy, but taxes that are eligible to be discharged in a Chapter 7 are also eligible for discharge in Chapter 13. When you file for bankruptcy, your tax debts must meet a certain standard in order to be discharged. Some of the tax debt that is not dischargeable is for taxes for which no returns have been filed. While the IRS routinely assesses taxes on un-filed returns, these tax liabilities cannot be discharged until the taxpayer files a return for the year in question. The return must be filed by the taxpayer. A commissioner-filed return does not qualify. If you file for Chapter 13 bankruptcy, money owed to the IRS that does not meet the qualifications to be discharged can be repaid through a payment plan that lasts anywhere between three and five years without penalties or continuing interest. (Although in some cases interest and penalties must be paid if there is a tax lien). One of the benefits of filing a Chapter 13 bankruptcy is if the IRS rejected your previous payment plan, this is a way to get them to accept one. It is recommended that you speak with your attorney tax debt relief And bankruptcy before deciding between filing Chapter 7 or Chapter 13 to get rid of or aid with the burden of tax debt. The type of debt you have plays an important role in what happens if you default on a loan. There are two types of debt. Secured and unsecured debt. 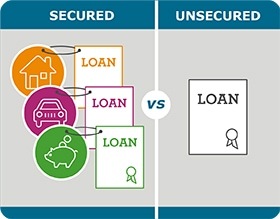 Secured Debt is any debt that is backed by some sort of physical property, such as a car loan or a mortgage. The car loan is secured by the car itself and the mortgage is secured by the home. In the event you fall behind on your payments on a secured debt, your creditor has the right to take back the property (repossess), sell it and apply the proceeds to the debt that you owe. Additionally, you may still have a balance owed even after the sale of the item is applied to the debt. Dealing with your secured debt in bankruptcy can be done one of two ways. The first way is by filing for Chapter 7 bankruptcy and returning the item so that you no longer have to make payments on it. The other option is to restructure your payments by filing for Chapter 13 bankruptcy and keeping the item. Either way, with any secured debt the creditor gets something in return. Unsecured Debt is typically a debt you incur to obtain goods and services. It can be medical debt, a student loan, a credit card or a personal loan. Essentially, there is no collateral tied to the debt. With this type of debt the creditor won’t be able to repossess the item you purchased but they are able to take legal action or garnish your wages to recover a balance owed. Filing for bankruptcy can ease the burden of both secured and unsecured debt. Filing for bankruptcy may even help you keep your car, stop wage garnishments, and remove some or all of your debt. Contact Minnesota Bankruptcy Attorney Gregory Wald for more detailed information specific to your situation. If you are thinking about filing for bankruptcy, contacting an experienced attorney is your first step. Below we list some differences between filing for Chapter 7 vs Chapter 13 bankruptcy to give you an idea of what to expect. You have little property other than basic necessities like furniture and clothing. You have little or no money left over each month after paying for basic expenses, or if you are not even meeting your basic expenses. The process of filing for chapter 7 is a rather quick one. You can receive your discharge in just a few months. Once you file, creditors cannot contact you once the automatic stay is in effect or after debts have been discharged. Upon filing for chapter 7, repossessions, foreclosures, wage garnishments, and harassment all stops. In order to determine whether you are qualified to file chapter 7, you must take the “means test” and complete the required session with a credit counselor. You have significant equity in a home or other property and you would like to keep it. You have a regular income and can afford living expenses but cannot afford to keep up with scheduled payments of debts. An advantage to filing chapter 13 is being able to keep your property while spreading out past due payments of a period of 3 to 5 years. You make one monthly payment to your bankruptcy trustee and will have no contact with creditors during the protection period of 3 to 5 years. Any individual debtor whose unsecured debts are below $360,475 and whose secured debts are less than $1,081,400 is able to file under chapter 13 bankruptcy. Rest assured that once you file for bankruptcy, your quality of life will greatly improve. You will no longer face harassing phone calls from creditors. Also, your attorney will fit you with a bankruptcy plan that benefits you and your family. If you are considering bankruptcy, comparing chapter 7 vs chapter 13 bankruptcy helps in finding the option best suited to you. If you need to file bankruptcy, save yourself a lot of misery and do it before matters reach this point. When you file a bankruptcy petition, the automatic stay protects against collection efforts and contempt of court. For more information regarding Chapter 7 vs Chapter 13, contact Minnesota Bankruptcy Attorney Gregory J. Wald at 952-921-5802 for a consultation.